Did you know each one of us have a way of knocking the door or pressing the calling bell? There are these hasty, speedy ones who go ‘dub, dub, dub on the door loudly, or press the calling bell incessantly or they would honk the car loudly, so much as to say, ‘hurry up, cant you see I’m waiting’; few would knock the door in intervals ‘dub, dub….then a gap…..then dub, dub’ these are the doubtful ones wondering whether to knock or not!!!! Then there are those who gently knock the door and wait for you patiently to open the door. During my stay in a pastor’s home, I heard a gentle knock on the door, very gentle – cautious, like that of a matured person. When I opened the door, I was astounded to see three year old Joel, son of the pastor stand outside. He neither spoke nor smiled but looked as though to ask me, ‘can I join you?’ I lifted him up in my arms and cuddled him, during my stay in that room, when I hear a gentle knock, I knew – it was Joel! Astonished, I asked the pastor as to how his three year old son could be so gentle, he said, ‘since I close the door and pray, I have always asked him to knock gently, hence this has become a practice for him.’ He is an amazing kid! 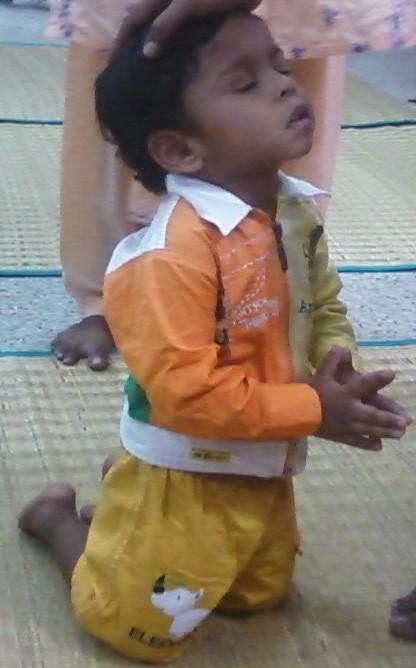 Here is a picture of Joel as I prayed for him! The above invitation of Jesus is enthralling! It was an open invitation: you either accept or dump it! Choice is yours! He would never do a gate-crash! He is gentle, patient but firm in His words:’ if any man hear my voice!’ It starts with hearing His voice! We got to first take off that head-set, the mobile, laptop, facebook, bike that is obsessing and obstructing from hearing His voice! Are you there????? Friend, Jesus stands at the door of your heart! 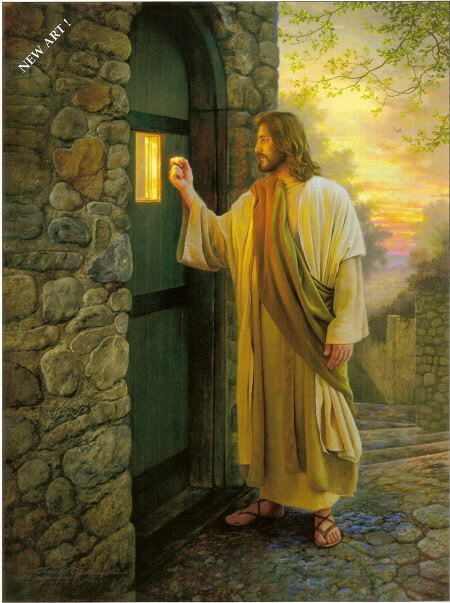 Not many would do this, the moment they find the door closed and not responding, they would leave – but not our beloved Jesus – He not only waits at the door but He knocks! He knocks through sickness, problems, divorce, debts, death, failure in order to bring awareness of His presence. If not for problems, many of us would never look above! He gently waits for you to hear the knock, open the door and invite Him in! Many of us have managed to rebuff all His gentle gestures and lived life on our own terms pretending not to hear Him. We have maneuvered to avoid Him and continue to keep the door closed for Jesus; yet, He stands waiting and knocking for you! Amala: Thank you for your kind appreciation! Yes, I would like the fire of His love to spread!